Baltimore, Walters Art Gallery, no. 37.1072. The picture is very thinly painted but it is not necessarily unfinished. It looks somewhat like a discreetly colored drawing painted over a light ochre ground (Kolch, 1983, 78, as reported by Elizabeth Packard). The heads of the Madonna and the Child and his left arm are more heavily painted. Elsewhere much of the underdrawing shows through the superficial layer of paint that has probably become somewhat transparent with age. The surface has been damaged, with considerable losses, around its entire edge; a rather large patch is missing at the top above and between the heads of the Madonna and the Child; considerable loss also to the right side of the Child’s left eye. Another loss immediately to the right of Christ’s head at the upper part of his back. Otherwise only minor losses. In several other places the paint has “curdled” and in part fallen off: at the hairline and neck and at the eyes of the Virgin and along the shadowed side of her nose and lips, in the hair of the Child, in the face of St. Joseph, and in the hair, face, and hands of St. John. The restoration of the painting was completed in 1965 at which time two added strips, each about 3 cm. wide, were removed from the left and right sides, as well as an added inscription at the upper right that read: P…mia. The losses have been filled. In a photograph taken after the old repaint had been removed there are what appear to be a small highlight in Christ’s left eye and in both of the Virgin’s eyes. The restored picture has sharp pinpoint highlights in both eyes of both figures. Such highlights are not found in any other painting by Rosso. The general color of the picture is a tan-ochre which is the color of the Virgin’s dress and of the general all-over ground of the painting. The drapery over the Virgin’s head and arm is dark green, almost black. Christ’s hair is brown; the left side of his garment and the part around his arm and shoulder are lightly brushed with bluish white moving towards a gray green. Joseph’s hair and beard are white; the drapery visible beneath his ear, a bluish green. John’s hair is brown, with pink highlights; the vine leaves in his hair are olive green and gray. His cross is olive green modeled with brown.At the end of the right arm of the cross is a highlighted ovoid form that cannot yet be identified. His drapery is olive green, the knot at the shoulder more blue. His nose is pink, as are the cheeks, chin, and ear of Joseph. The pillow at the lower right upon which Christ stands is dark olive green. PROVENANCE: Rome, Don Marcello Massarenti Collection; purchased by Henry Walters in 1902. Donner, Otto, Catalogue of Pictures, Marbles, Bronzes, Antiquities, etc., etc., Rome, Vatican, Piazza Rusticucci, 18, Palazzo Accoramboni, Rome, 1894 (Marcello Massarenti Collection), 32, no. 260; French edition, 1897, no. 286, as Correggio. Carroll, 1964 (1976), I, Bk. I, 56–57, 61, Bk. II, 116–117, P.11, III, Fig. 19, as Rosso, ca. 1519. Mentioned as Rosso’s by Federico Zeri, “The Italian Pictures; Discoveries and Problems” [at the Walters Art Gallery], Apollo, LXXXIV, Dec., 1966, 450. Exhibited as Rosso’s at Wildenstein’s, New York, in 1967 (An Exhibition of Treasures of the Walters Art Gallery, Baltimore, Maryland, 16 March – 15 April, no. 22). Fredericksen and Zeri, 1972, 179, 557, as Rosso. Federico Zeri, Italian Paintings in the Walters Art Gallery, II, Baltimore, 1976, 323–324, no. 210. Kolch, 1983, 75, 78, as unfinished and done around 1519. Wilmes, 1985, 108, 110, 111, Fig.12, as done between 1518 and 1521, and probably unfinished. Béguin, 1988 (1989), 14, as Rosso, 1527–1530. Zafran, 1988, 52, no. 17, Color Pl., as Rosso, unfinished, and done about 1519. Franklin, “Portrait,” 1989, 840, as Rosso. Ciardi and Mugnaini, 1991, 18, 24, 62–63, no.9, with Fig., as Rosso, apparently around 1519. Franklin 1994, vi, Color Pl., 73–76, 83, 153, 278, n. 75, Color Pl. 54, as unfinished and an oil sketch done slightly after the Villamagna altarpiece of 1521 from which it would seem to derive, but also that an immediate source of the design may have been a Sarto composition of the Virgin and Child under a Baldachin known from copies (Shearman, 1960, I, Pl. 30c; II, 210, no. 24); St. John wears an animal skin and holds a reed cross. Mugnaini, in Rosso e Volterra, 1994, 160–161, no. 15, as seeming to take up motifs from the Volterra Deposition and the head of the Virgin as in the Villamagna altarpiece; St. John wears an ivy crown. Ciardi, 1994, 25, 27, Fig. (detail), as showing the influence of Masaccio, and non-finito at the margins but not at the top and center. The style of the picture closely resembles that of the S. Maria Nuova Altarpiece of 1518 (P.5) in the types of figures that are represented, in the mode of their characterization, and in the linear clarity and painterly looseness of its execution. But the planes and forms in the Baltimore painting are somewhat broader and less sharply faceted, and the drawing of the contours is more cursive and continuous. These differences indicate a change in style dependent in part on the influence of Pontormo that is most fully evident in the Deposition at Volterra (P.9) and in the altarpiece from Villamagna (P.10), both of 1521. 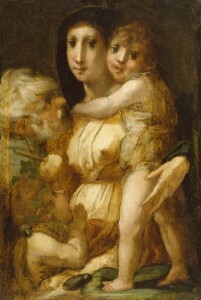 The process of this change and evolution is indicated by a few drawings of which the study for an altarpiece in the Uffizi (D.4) most closely resembles the Holy Family. That drawing appears to follow almost immediately upon the altarpiece of 1518 and would seem to date around 1519. The Baltimore picture, with the almost identical Virgin and Child and St. Joseph, and with the same kind of broad planes of light and clear contours, must be of approximately the same date. The appearance of the young St. John may indicate that it was done in Florence. With the Uffizi drawing the Baltimore painting seems to me to anticipate rather than follow the Villamagna altarpiece and its more tragic implications. One detail that has not generally been noted is that the Christ Child stands on a pillow. 1I should like to thank Elisabeth Packard for sending me the measurements of the panel in 1966 after the modern strips that had been attached to it were removed. 2 Mr. Clark’s attribution was kindly brought to my attention by Mr. Myron Laskin. Miss Bernice Davidson had independently suggested the same attribution in 1950.